I feel like I’ve been looking for this exact book for years! As a counselor I am often attempting to help couples navigate the dynamics of family life. There are great resources out there on the foundations and theology of a Biblical family. There are also great resources on communication, conflict resolution, parenting, and a host of other family related subjects. But on the issue of crafting a family vision I’ve often been found searching for some assistance. Belonging and Becoming is the strategic resource I have been wanting. Writing from experience, then, the Scandrettes give readers some helpful tools and a clear vision for bridging that gap. They found a way to go from chaos to thriving, and they write to help others do the same. The book’s eight main chapters unpack the process. The author’s delineate what a thriving family looks like. They write about vision casting, purpose, rhythms and routines, the narrative of your family, cultivating connections, nurturing growth, gratitude, and productivity. Each chapter unpacks one of these ideas and gives the reader tools to implementation. There is a great deal of breadth covered here, but not so much that readers will feel overwhelmed, as if the idea of thriving family is really inaccessible to them. The value of the book is that it is more than merely descriptive. Each chapter includes exercises that couples can do together, and which families can do together. There are often evaluative tools to help identify your current situation, and then planning tools to help readers move from their current situation to a thriving situation. 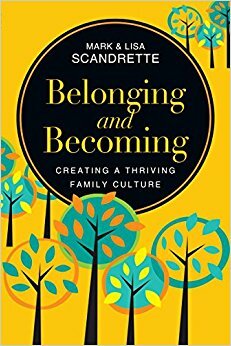 While other books describe what a healthy family looks like, Belonging and Becoming does more than that. This book doesn’t simply describe the healthy vision of family life, it helps readers to implement change in order to achieve a similar vision. In addition, the Scandrettes are not convinced that their specifics are universally applicable. They give lots of breathing room for individuals to develop the vision of the good life that best fits their family. My family does not look like theirs, and yours won’t look like mine. That’s okay. Their principles are guidelines to follow to a specific vision that best first your family. In other words, this is not a book about how to be the Scandrettes. It’s a book about how to be the kind of family that God has called and created you to be. This is one of the best family books I’ve read in years. It is engaging, beautifully compelling, and rich in application. I have found it extremely beneficial for my own life and anticipate it being a regular tool in my counseling of others. I highly recommend Belonging and Becoming.